Home » 2013 » Pedal Farmers use Guerilla Haiku to spread word about their work in Newark! A group of students from all over Newark and surrounding areas are brought together by local non-profit, Project USE, in the summer to tend gardens. Self-anointed “The Pedal Farmers” these intrepid youth not only tend community gardens, they sell their produce at local farmer’s markets learning much about organic food; growing, eating and marketing it. 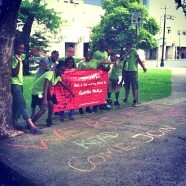 As a team-building activity, these youth came together to cover the Ironbound in haiku one hot, early morning. Though many commuters were set on their morning routine, others were interested in our pursuit of poetry, and these teens showed tremendous persistence, charm, and a remarkable ability to listen. Here’s to Newark, and the Pedal Farmers! Find them at your local Farmer’s Markets. Just look for the chalk!! For a complete set of photos, check ‘em out HERE.